Back in March, I started a new series called Stepping Outside My Comfort Zone. In the first post, I explained the psychological benefits behind trying new, unfamiliar types of things. The next month, in this post, I shared some of the ways I had stretched beyond my comfort zone. 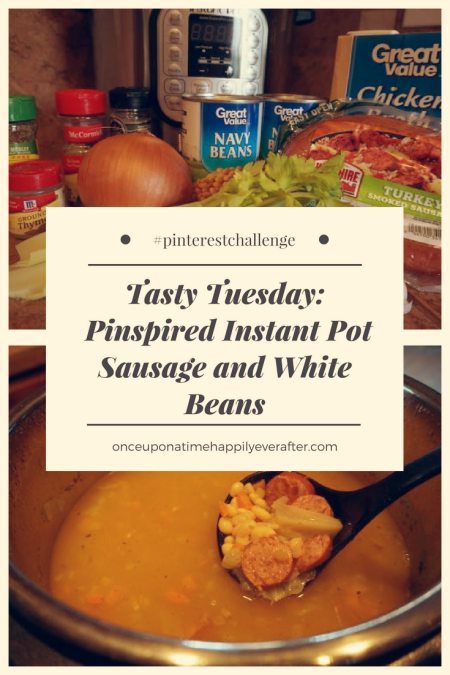 Which brings us to today’s edition of Tasty Tuesday for which I used my Instant Pot the very first time. 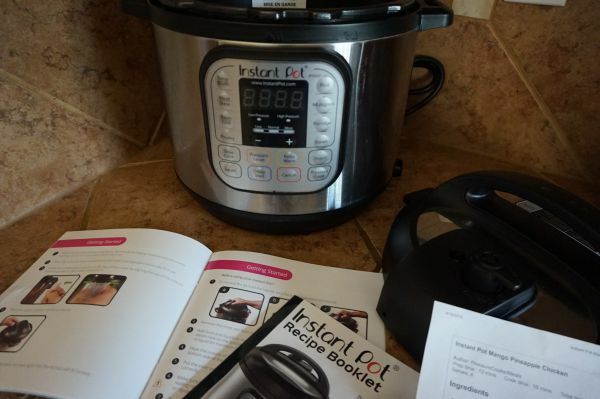 For my happy birthday in April, my daughter Brennyn gave me an Instant Pot. She has one, too. And we both have been wanting to find out what all the hub-bub is about. I looked on Pinterest for a simple recipe to use for first time out of the gate. Originally selected this recipe for Instant Pot mango pineapple chicken. Required only 4 ingredients and could be prepared and cooked in 20 minutes! But when I looked at the recipe after consulting the manual for my Instant Pot, I had lots of questions. The 4-step directions were written more for someone who has cooked with an Instant Pot before, not a novice like me! So, I scoured Pinterest some more for a good first timer recipe. I decided on this Instant Pot sausage and white beans recipe on Pinterest from Simply Happy Foodie. Decided to kill two birds with one stone by making this my May Tasty Tuesday post. 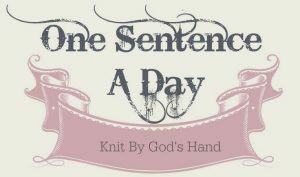 And my post for the May Pinterest Challenge Blog Hop, hosted by Erlene at My Pinterventures. Joined up in April with my painted rock cactus garden DIY. 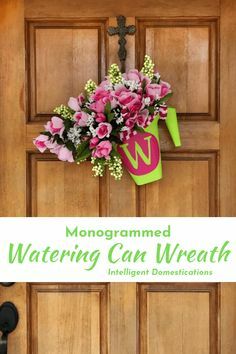 The purpose of these Pinterest Challenges is to motivate all the participants of this hop (and you, too) to not just pin, but to make it happen! I pinned it and did it! Meet me out in the kitchen with your Instant Pot and we’ll get this party started. 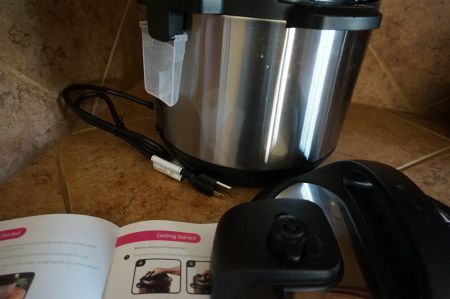 First thing, I pulled the Instant Pot out of the box with all of the instructions – as if I was going to read them! I did read enough to know to wash the pot out with warm sudsy water. And to attach the reservoir in the back and the power cord to the pot before plugging it in. After that, I put all of those directions away. This recipe was going to be a really good one for teaching me how to use my Instant Pot. Here’s what you will need to make Instant Pot sausage and white beans. 1. Turn the pot on to the sauté setting. Let it heat up and add the olive oil. I do realize that you guys know what “on” looks like but I just wanted to show you a picture up close and blurry of my Instant Pot controls…lots to choose from. 2. Cut sausage in rounds about 1/4″ thick. Check out my new veggie chopper! Wore the first two out. 3. Add sausage to heated oil and let it brown a few minutes, then turn it over to brown on the other side. 4. Chop onion, carrots and celery. Add the bay leaf and chopped veggies to the pot. Stir and cook until the onion starts to turn translucent. 5. Make sure to scrape any brown bits from the bottom of the pot (deglaze) as the vegetables cook. 6. Add the thyme, rosemary, oregano, and garlic. Cook, stirring for 1 minute. 7. Add the salt, pepper, and broth. Stir, and then put a glass lid on the pot and let the contents come to a simmer. With all of these settings, I didn’t see one for ‘simmer’. So, I switched to ‘slow cook’. 8. Once the broth is simmering, add the beans and stir. 9. Put the pressure cooker lid on, lock in place, and set the steam release knob to the sealing position. I had to get my direction manual out of the drawer for a diagram to see how that looked. This steam release business scares me! 11. The pot may take 10 minutes or so to come to pressure, but since the contents are already hot, it will pressurize quicker. 12. Once the cooking cycle has finished, let the pot sit undisturbed for 15-20 minutes natural release for dry beans or 10 minutes natural release for canned. I wasn’t sure what this meant. Called my daughter – easier than getting my manual back out. Brennyn said the steam would naturally release without adjusting the steam release valve. So, I just left the pot alone at this step for 10 minutes. 13. Next, turn the steam release knob to the ‘venting position’ to release the remaining steam/pressure. Please use caution. Do as I say, not as I do…I leaned over mine to see if the steam was coming out! No bueno. In this first photo below, you can see the steam release knob more clearly. And all that steam!! 14. When the venting pin in the lid drops down, open the lid, facing away from your face, and set aside. 15. Use a long handled spoon to gently stir the beans. Taste a few to test for tenderness and for salt, and adjust salt if needed. So, my sausage and white beans were a little on the soupy side. In fact, PC thought we were having bean soup! Now, having written this post, I realize what I did wrong. I added 6 cups of broth (for dry beans) instead of the 4 cups of broth suggested for canned beans. This last photo is really blurry, I am sorry. I served the sausage and white beans soup? with gluten-free Krusteaz corn bread. PC really liked this meal. It was a great way to get some veggies into him. The broth was very tasty. And using turkey sausage makes this a Weight Watchers-friendly recipe. I would definitely cut back the chicken broth to 4 cups, though, next time. Now that I have stepped outside my comfort zone to use my Instant Pot, I can tell we are going to be good friends. My old crock pot is going to get a much deserved break from time to time, with this new kid on the block. Felt proud of myself to learn how to use this newfangled gadget. 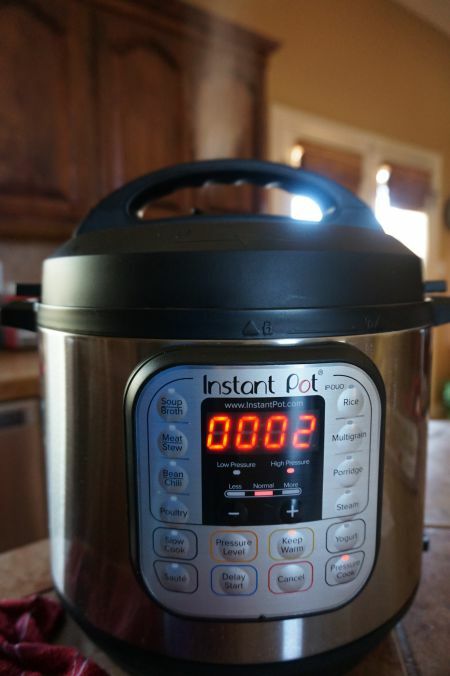 Do you have an Instant Pot yet? If not, come on in, the water’s fine!! I am kind of old school in thinking that everything tastes better if it has cooked all day. But having dinner on the table in 30 minutes or less could rapidly change my mind! How ’bout you? Would be pleased as punch to have you follow my new InstaPot Magic Pinterest board. And share your fav Instant Pot recipe below. If you are a blogger interested in joining next month’s #pinterestchallenge, click here to sign-up ⇒ June Pinterest Challenge. Rebecca – Simple Practical Beautiful • Gwen – Geez, Gwen! We keep getting white beans in our weekly CSA delivery and I’ don’t know what to do with them. 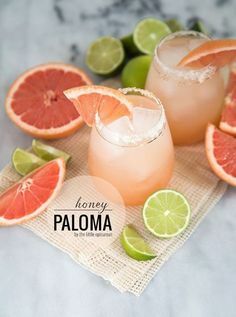 I’m going to add this recipe to the to-make list! This looks really tasty! 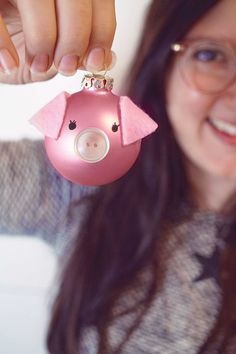 I don’t have an instant pot, but I wonder if I could do something similar in my slow cooker. 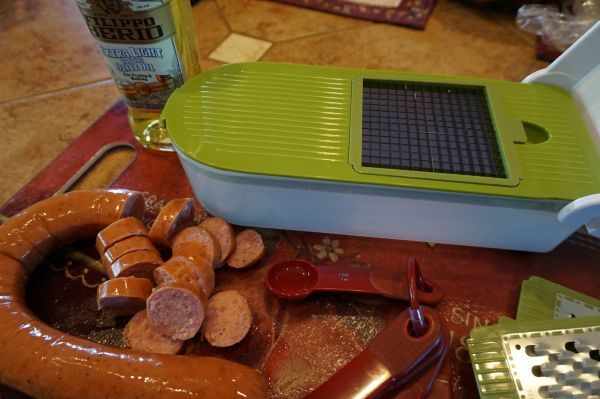 I really like smoked turkey sausage. It’s so good! 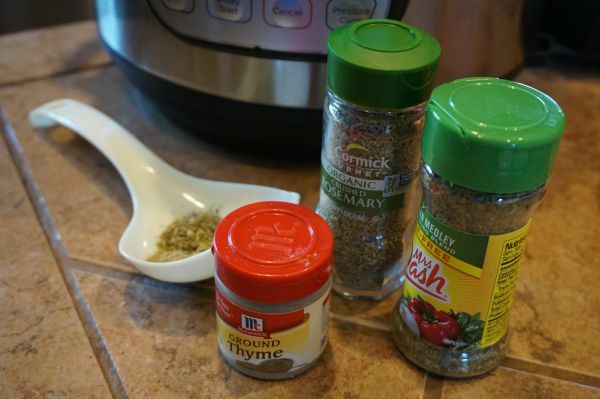 I am sure this Instant Pot beans and sausage recipe would work in the crock pot. Actually, since I am not working right now, I would prefer using my crock pot. 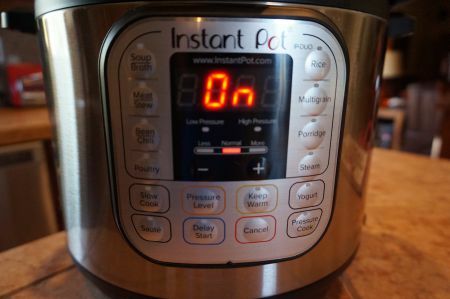 But for busy working wives and mommies, the Instant Pot is a dream. 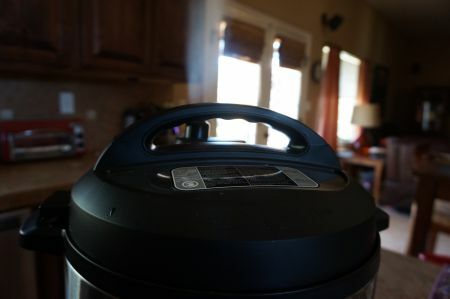 YOU would love an Instant Pot as busy as you are and as hectic a life you lead. Really for me, now that I am home, my crock pot serves me well. But an Instant Pot would save you so much time. 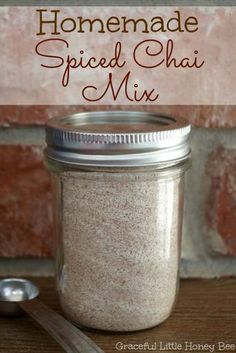 I was scared to use my Instant Pot but this recipe was a good one to start with because it explained every step and every setting on the pot. 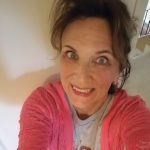 I am following you on Pinterest so will check out your Instant Pot board. Thank you, sugar foot!! 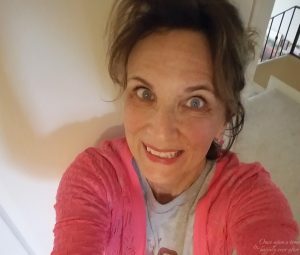 Leslie – Great job stepping out of the comfort zone and trying out your new Insta Pot! Thanks for sharing your experience and the recipe looks wonderful! Pinned. I too have been thinking about purchasing an Insta Pot, but haven’t pulled that trigger yet. Come on, Laurie, you need to pull the trigger and buy that Instant Pot!! If you are a busy gal, you need one in your life. I am actually not nearly as busy I was when I worked and mommy-ed full time. But they are divine for allowing you to prepare a substantial meal in no time. 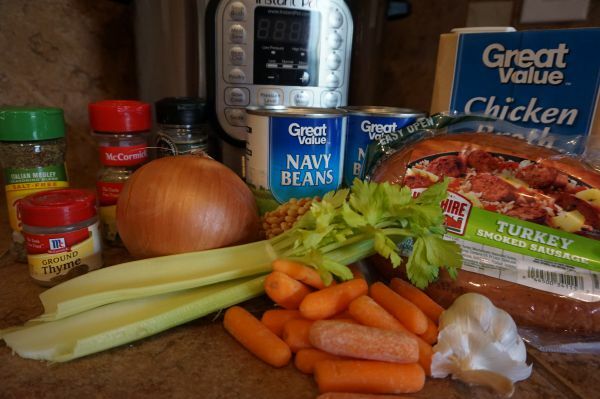 This sausage and beans recipe was really easy to follow for me and a great one to use to get my feet wet! Hope you will give it a try. Thanks for coming by! This looks yummy! I feel like I really need an Insta Pot because I love the idea of putting everything in and it being ready in 30 minutes or so. It’s tough to move outside of our comfort zone, but it’s worth it. Thanks for sharing this journey. Moving out of my comfort zone to try this Instant Pot was huge for me but well worth it! If you are a busy gal, you need an Instant Pot in your life. I am actually not as busy as I was ten years ago but love the idea of being able to prepare a substantial meal in minutes. Thank you, love!! I think everyone has one of these pots but me! 😂I still just use my 30 year old crock pot. This recipe looks delicious! Pinning! But I’ll make it in my crock pot! You know what, there are a lot of us who have been eyeing these Instant Pots without jumping in yet. I love love love my crock pot so felt like a colossal trader using this newfangled gadget over my faithful friend. And this recipe will easily work in the crock pot instead. But the Instant Pot is genius for saving time on those hectic days. I do not have an insta pot but I too enjoy trying to step out of my comfort zone. For the past few years I’ve had a goal of trying 52 new things with my boys; some big and some small. It’s a wonderful way to grow! Pinned. JoAnne, we are doing a series about stepping outside our comfort zones. Would LOVE LOVE LOVE to have you join us! We post the last day of every month. You could inspire lots of younger gals to try new (little and big) things in their lives. Please let me know if you would like e to add you to our email group for reminders and link-up codes. We would love to have you!! I don’t have an instant pot but you made it look so easy. 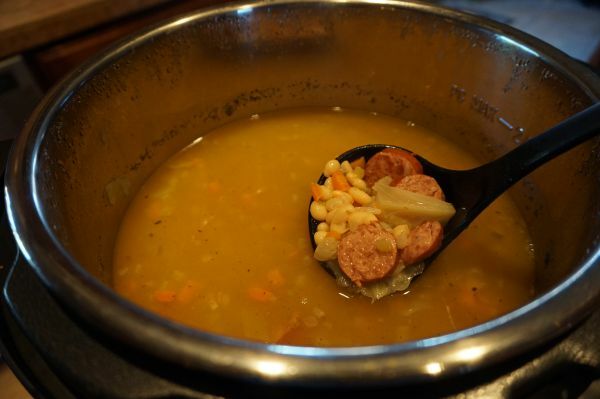 The sausage and white beans sound so good, The other recipe you mentioned sounds good also. This Instant Pot recipe was the perfect one to follow for newbie users. Hope, if you are in the market for a pot, you will get one and try it. 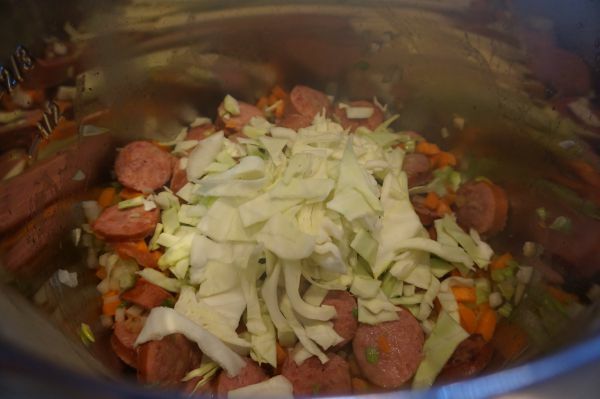 Or give this sausage and bean recipe a go in the faithful crock pot. Still my best friend. 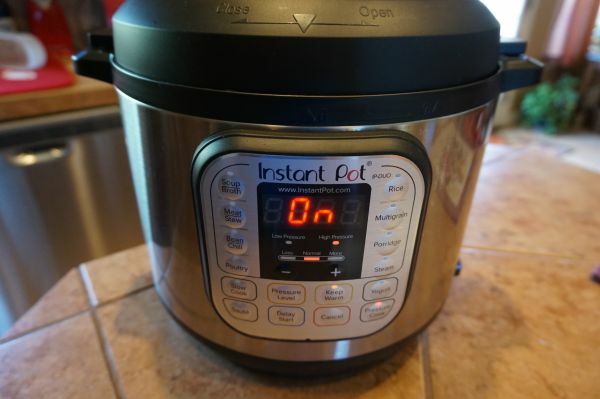 I don’t think my Instant Pot will ever totally replacement my old buddy. Sounds like a really tasty recipe, the kind my fellas love. We gave our daughter an Instant Pot for Christmas but don’t have one ourselves. I created a Board for Instant Pot recipes though and that is where this recipe is going. I have not cooked Navy beans in years but it sounds tasty to pair them with the sausage and seasonings. Thanks for pinning my Instant Pot bean and sausage recipe. Hard to believe that it can be prepared and to the table in less than 30 minutes!! Welcome to the Instant Pot bandwagon. I bought one for my son and he has made good use of it. You get slow cooked flavor in very little time! I agree with the poster above who commented about cooking this in a slow cooker, you could also do it on top of the stove in a dutch oven. So many ways to make this tasty meal, it all depends on the amount of time and attention you have to give! Hey Lydia, thank you for coming by my blog and leaving a comment. I need to get my Instant Pot back out before I get scared to use it again. Made a ravioli and meatball soup in the crock pot (my BFF) yesterday but should have done it in the Instant Pot. 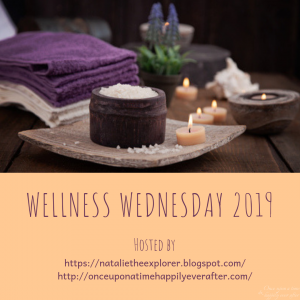 Going to stop by your blog today! Hope you will come back for another visit. Or maybe we could team up and both do a recipe in our Instant Pots? Get one, get one!!! Pull the trigger and get an Instant Pot and then let’s do an Instant Pot link-up together. We can all share recipes and get more comfy using them! I have not jumped on the instant pot band wagon yet. Right now I prefer my slow cooker because I can put everything together before I go to work and it’s ready when I get home. Maybe when I retire in a few years the instant pot will have more appeal. Your sausage and white beans does look delicious! I used the heck out of my crock pot before I retired and still call it my BFF. But this Instant Pot stuff is pretty cool. Dinner in 30 minutes and it tastes like it cooked in the crock pot for hours. I need to get my Instant Pot back out before I get scared to try to use it again. If you get one, let’s do an Instant Pot recipe link-up together! !